At Ashbrook Roofing, our extensive selection of roofing materials includes a range of solar paints, which are designed to prolong the life of your roof. Solar roof paints are aluminium based to create a reflective coating on metal and bituminous roofs, which reflects damaging UV rays and reduces heat ageing. This is an affordable and simple measure to take, which will extend the life of a metal roof and reduce the need for maintenance. Need to replace a damaged metal roof? 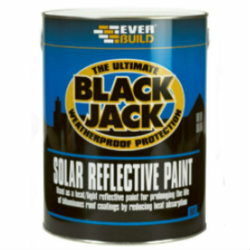 Applying solar paints to an old roof won’t be able to rectify damage that’s already been done. However, we also supply roofing sheets, including ones made from metal, should you need to completely replace an existing roof. Buy your solar reflective paints online from Ashbrook Roofing today. We’re also on hand should you want to ask any questions about our products or obtain free and impartial advice from our team of experts.